What are you doing April 14, 2019 from 2-8 PM? 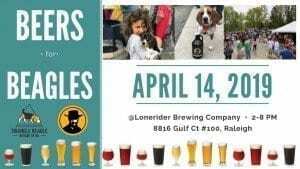 We sure hope you are spending it with Triangle Beagle Rescue at Lonerider Brewing Company for Beers for Beagles VI! Cockadoodlemoo Truck is confirmed as our food truck! Their food is so yummy and they always donate a % of their sales to the beagles! International Desserts by Poblanos will be serving up yummy desserts for the event! Bumble & Hound will be a vendor and they will donate a % of their sales to the pups!